Fans of Monty Python will recognize the source of this Medieval-style ale, brewed with, of course, elderberries. A word to the wise; Medieval beer is different. Very different from modern beer. I happen to be a fan, most, I think, are not. Hoppiness is very subdued (on non-existant) and in its place are all sorts of weird herbs and spices and flavors you might not generally associate with beer. Here, the nose isn’t terribly intense, but it does have light notes of bread, molassas, and smoked peat. The middle is spicy, with strong peppery heat and bitter herbs. There’s a sweetness at the end of the middle, where you can really taste the berries (elderberries, I presume, though never having had them on their own, I can’t swear it) and a dry, bitter bite at the finish. The pepper lingers all the way through. The body is medium to heavy, and the alcohol is a robust 10.3% ABV. It’s a strong ale, but I wouldn’t really call it an American Strong Ale, as there’s nothing in it that suggests it was fomulated after beer (hopped, by this time) made its way to these North American shores. In my opinion, this is a lovely formulation, and well executed. A fine brew. 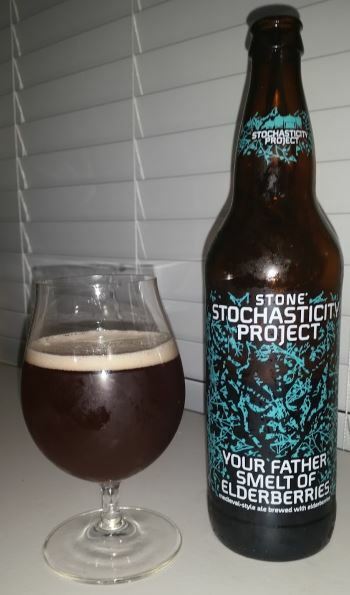 This entry was posted in Reviews and tagged Ale, Ancient Ale, California, Stochasticity, Stone, Strong Ale on March 29, 2016 by Xander. Orpheus Brewing in Atlanta makes some killer IPAs, and this is one of them. Life.Death.Life.Truth is an American IPA that is bursting with fruit, primarily of the citrus varieties. The nose has orange and lemon, the middle has a huge hit of grapefruit and is fairly bitter, fading to a sweet finish of sugary orange and sticky pineapple, with another tiny hit of dry bitterness right at the very tail. The body is medium and the alcohol is a robust 7.2% ABV and it’s nicely hidden. I love Orpheus beer, and this is a particularly good one. 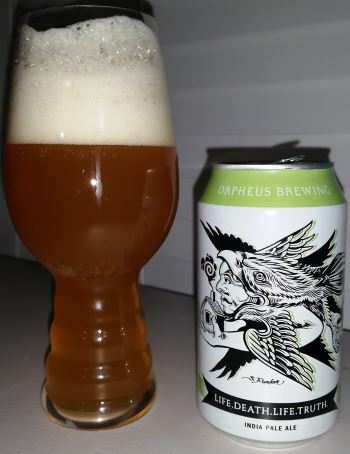 This entry was posted in Reviews and tagged Ale, American IPA, Georgia, IPA, Orpheus on March 25, 2016 by Xander. 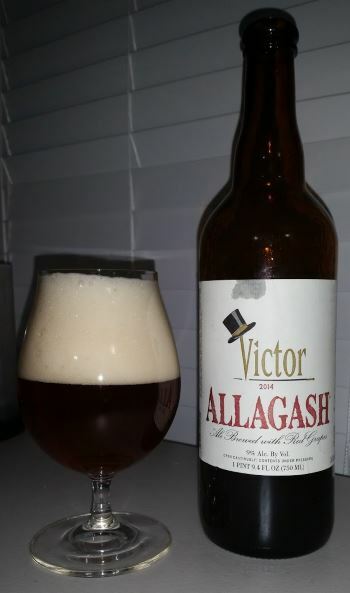 Victor is a Belgian Strong Dark Ale from Maine’s Allagash Brewing. The Belgian heritage is immediately apparent with a fruity, sour wild yeast nose that promises good things to come. The middle is tart, and bursts with fruit including cherry, banana, raisins and a bit of licorice. The finish is spicy and sweet with pepper, brown sugar and sweet cherry notes. It’s a medium to full bodied beer, and an appropriate 9% ABV, which is just right for the style and well hidden, only coming through with a bit of heat in the finish. Another astoundingly good beer from Allagash. This entry was posted in Reviews and tagged Ale, Allagash, Belgian, Belgian Ale, Belgian Strong Dark Ale, Maine on March 22, 2016 by Xander. I’ve finally gotten my hands on a 120 Minute IPA. It’s immediately apparent that it’s big, with nose full of honey and molasses and lemon. The body is heavy, with a strong alcohol presence and the middle is punchy with the huge quantities of hops and malt required for this brew. There’s more honey, as well pear, apricot, pine and pepper making an appearance here. The finish is sticky and sweet, with orange and honey predominant. This is an interesting beer with an interesting niche. It’s not what you would expect of a typical Imperial IPA, more like a barleywine or Belgian Strong Dark Ale, but far hoppier than either of those styles. It may actually be a beer that appeals to whisky or fortified wine fans more than a fan of typical beer styles. It’s certainly got enough alcohol for that, at ~20% ABV. (Variable for each batch.) I’m very impressed with the construction. This is really a special beer. 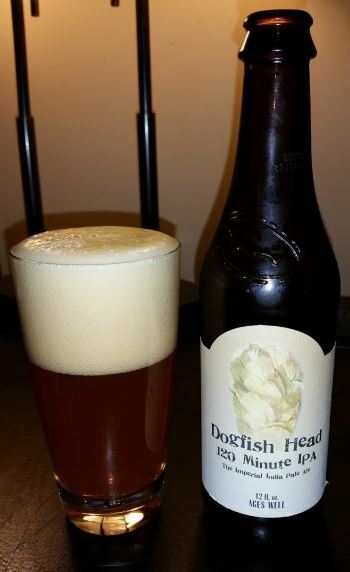 This entry was posted in Reviews and tagged Ale, Delaware, DIPA, Dogfish Head, Imperial IPA, IPA on March 18, 2016 by Xander. For their 20th anniversary, Dogfish Head has released Higher Math, a golden ale brewed with chocolate and sour cherry juice that they call “birthday cake in liquid form.” Stylistically, it is an American Strong Ale that reminds me of what an Imperial Barleywine would be, if there were such a thing. It’s truly massive at 17% ABV, with a thick, heavy, sweet body that does in fact evoke the essence of birthday cake. The head is thin and dissipates quickly. The nose is of prunes and cherries. The body is thick and syrupy, with the cherries coming on strong, and semi-sweet chocolate rising to the fore in the finish. It is indeed like cake, but just coming off a bad cold, is it also unfortunately similar to the memories of Nyquil that are so fresh in my mind. Dogfish Head is known for oft-centered ales and crazy concoctions, and heaven knows I love them for it. 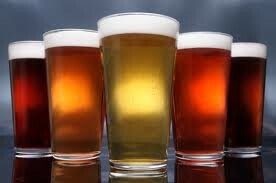 But, this also means that for any given palate, some are going to be hits and some misses. For me, this one is a miss. I give it a 2.8 out of 5. This entry was posted in Reviews and tagged Ale, American Strong Ale, Delaware, Dogfish Head, Strong Ale on March 15, 2016 by Xander. Dark Penance is a big 100 IBU Imperial Black IPA from Grand Rapids, MI based Founders Brewing Company. It’s certainly hoppy, but it has a solid malt backbone that balances it out, making it fully worthy of that Imperial classification. The nose is spicy with prunes, caramel, and earth. The middle has sweet dark fruit and brown sugar, balanced by bitter coffee notes. More earth and spice and tart cherries are waiting in the finish with a slight metallic bitterness right at the end. The body is medium to heavy and the alcohol is a stout 8.9% ABC. This makes for an excellent fall or winter evening beverage. 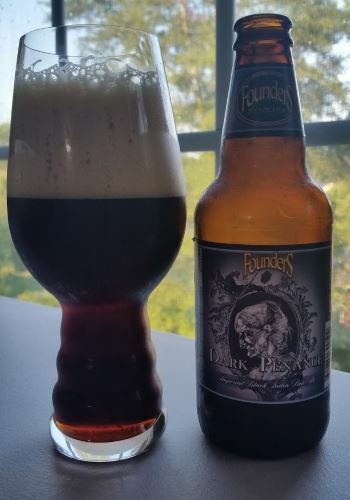 This entry was posted in Reviews and tagged Black IPA, DIPA, Founders, Imperial Black IPA, Imperial IPA, IPA, Michigan on March 11, 2016 by Xander. Fluxus is an anniversary beer for Allagash, and they brew it differently every year. For 2012, it was a Belgian golden ale brewed with barley and spelt malt, and then spiced with green and pink peppercorns. The Belgian yeast is immediately apparent in the nose, which has notes of peach and apricot. The middle is fruity, with plum and grapes added to the mix. There is a hint of spice from the pepper in the finish, but it’s very mild, and it offers a pleasing contrast to the sweet fruit. Beyond the pepper, the finish is best described as buttery. The body is medium to heavy, and the alcohol is a reasonable 7.7% ABV. This entry was posted in Reviews and tagged Ale, Allagash, Belgian, Belgian Ale, Belgian Golden Ale, Golden Ale, Maine on March 8, 2016 by Xander.